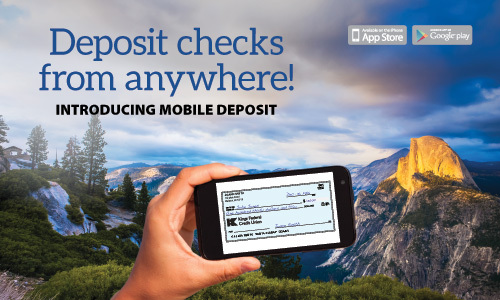 Mobile deposit will be automatically enabled in your mobile application based on your account being in good standing. Endorse the check with your signature and “For Mobile Deposit”. Open the Kings Federal Credit Union Mobile Banking App. Select the Checking account you want to deposit the check into. Upon your receipt of a confirmation from Kings Federal that we have received an image that you have transmitted, you agree to retain the check for at least 30 calendar days from the date of the image transmission. After 30 days, you agree to destroy the check that you transmitted as an image, mark it “VOID”, or otherwise render it incapable of further transmission, deposit, or presentment. During the time that retained check is available you agree to promptly provide it to Kings Federal upon request. Deposits received via the Service are processed on our mobile deposit business days, which are Monday through Friday, excluding holidays, until 4:00PM PST if approved will usually be deposited into your Account by 8:00PM PST. Deposit items that we receive after 4:00PM PST or on non business days will be processed on the next business day that we are open. The first $200 of your deposit will be made available to you on the first (1st) business day following the day we post your deposit into your Account. The remainder of your deposit will be available by the second (2nd) business day after the business day on which we receive the deposit. Eligible Items: You agree to scan and deposit only “checks” as that term is defined in Federal Reserve Regulation CC (“Reg. CC”). When the image of the check transmitted to Kings Federal is converted to an Image Replacement Document for subsequent presentment and collection, it shall thereafter be deemed an “item” within the meanings of Articles 3 and 4 of the Uniform Commercial Code. Checks drawn on a financial institution located outside the United States or not in United States currency or issued by the U.S. Treasury Department.